Shaq Thompson? I recognized that name from somewhere. I haven’t really ever followed college football so I knew it had to be something other than football. Eventually, it came to me. Shaq Thompson, the most versatile college football player in the nation, had the worst statistical career in professional baseball history. In high school, Thompson was a football and track standout. He played in the 2012 U.S. Army All-American Bowl and specialized in the 200-meter dash. After his senior year, Thompson was the no. 1 safety recruit and the no. 4 overall recruit in the nation. He committed to play football at the University of Washington. Thompson, now a junior linebacker for the Huskies, has thrived on the gridiron and has earned national recognition as one of the best all-around players in the country. So where does his baseball career fit in? Shaq Thompson went 0-39 with 37 strikeouts. His career line was .000/.170/.000. Over his 47 plate appearances, Thompson put the ball in play twice while striking out 79% of the time. He had a .170 OPS, which was also his OBP. Even if you lower the minimum plate appearances threshold to 40, only two position players in baseball history have had a lower OPS for their careers. The next closest (and most recent) is Cincinnati infielder Neftali Soto, who has hit .071/.091/.095 in his first 44 plate appearances. Of course, that’s in the big leagues. Unfortunately, there is no Play Index for the GCL or any level of the minors, so I’m only 99.99% certain that Thompson holds the title for Worst Professional Career Ever. Thompson’s eight walks can most likely be attributed to some combination of the inexperienced pitchers he was facing and the presumed occasional strategy of just not swinging at all. Thompson had the 6th most strikeouts on his team and the 16th most plate appearances. I could go on, but I already feel kinda bad. It doesn’t take advanced stats to know how bad he was. Although, let’s give him credit: he did have one RBI. I agree: Shaq Thompson’s failures in the GCL don’t definitively tell us anything about professional baseball or Thompson himself. And yet, his brief stint in pro ball can give us some perspective. If you take a not-so-scientific look at the Crazy-Athlete-Trying-To-Play-Baseball Spectrum, you’ll see that most of those attempts to play pro ball end in failure. Thompson certainly represents one end of the so-called spectrum, but there are countless other examples of ‘lottery ticket’ athletes flaming out in the low-minors, much to the chagrin of their respective organizations. However, teams — some more than others — will continue to gamble on these super-freaks with the hope that just one of them really does evolve into a franchise-type player. More than anything, I’m genuinely happy Shaq Thompson has rebounded so well from his briefly cataclysmic baseball career to become one of the best college football players in the country. ESPN’s Todd McShay recently projected Thompson to be a mid-1st round pick in the 2015 NFL draft, citing him as a “unique talent with an outstanding combination of size, speed, and athleticism”. Thompson’s success on the gridiron only further proves Petchesky’s point that his struggles in pro ball don’t really tell us anything about Thompson or baseball. It was just a remarkably ridiculous thing that happened. Thompson tried one professional sport and failed spectacularly. He’s about to try another professional sport, and has a much better chance at succeeding. That’s pretty awesome! Two professional sports! There have been plenty of other great football players drafted by baseball teams based on their athletic abilities and performance in high school. Most of them never step foot on a minor league field. You know who else was drafted out of high school in the 18th round? Tom Brady! Tom Brady could have been the one to go 0-39 with 37 strikeouts. We’ll never know. I’m obviously not faulting Brady or any other athlete that chose to forego baseball for other sports, but give Thompson credit: he tried! Just because he turned to be the one to go 0-39 with 37 strikeouts doesn’t mean he’s the only one that could have gone 0-39 with 37 strikeouts. In fact, I’m almost positive Jon Heyman would’ve gone 0-47 with 47 strikeouts if given the opportunity. Shaq Thompson may hold the title for Worst Professional Baseball Career Ever. But he also briefly held the title of Professional Baseball Player. Soon, he’ll hold the title of Professional Football Player. That’s more than you or I can say. Unless Bo Jackson is reading this, in which case, hey Bo Jackson! If you are reading this you probably know what #MUPWATCH is. If you don’t you should get a Twitter account and then watch this video. Please also follow @jessespector and @amandarykoff for all your #MUPWATCH needs. As of 2:37 ET on Monday, October 7th, there have been 32 instances of baseball related #MUP lightings. The Pirates lead the pack in lit #MUPS as their storybook season has taken a dangerous turn. Not far behind them are the St. Louis Cardinals. The Cardinals must change their ways before more #MUPS fall to the arson’s torch. 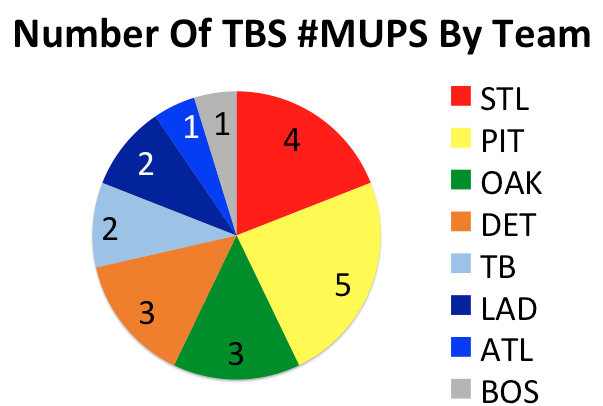 The Braves and the Red Sox only have one #MUP lit apiece and have done a fantastic job of keeping #MUPS out of harm’s way. Scientists believe the Navy/Red color scheme might be keeping the #MUPS safe, but I personally think that the #MUP lighters, whomever they may be, tend to stay away from foam tomahawks and beards. A lit #MUP at PNC park. At least the #MUP’s last memory was in a nice place. A #MUP reportedly lit at Dodger Stadium stuck in post game traffic. I heard a #MUP at Busch Stadium in St. Louis. I will never be the same. Three more unspecified #MUPS. May the families of these unclaimed #MUPS find peace in these troubling days. We were out at the Hagerstown Suns game all night, so I have absolutely no clue what happened in the national ballbasket draft, but based on my past knowledge of the sport, I’ll recap the night’s exciting action the best I can. Even if I have no clue who was taken by who when where why what which whatever. The NBA Draft Lottery: WHAT DOES IT MEAN ?! Jake’s home, and what better way to celebrate then watching one of the dumbest exercises in sports? 8:41 PM: White guy walks to podium. He is the senior vice president of NBA security. What that has to do with anything…we have no idea. He could clearly pass as a first baseman/first base coach. I don’t watch football anymore. I tried to watch the NFL Draft. This is how it went. 7:47 PM: ESPN cuts away to what is most likely their final commercial before the draft begins. There is an intense montage showcasing three athletic looking humans that I have never seen in my life. One of them is named Geno. 7:52 PM: Mel Kiper is yelling at me about Geno’s mobility. They don’t seem to be listing his home to first time, so it’s hard to say how fast he actually is. 7:57 PM: They’re discussing potential top pick Eric Fisher who is approximately 7″4 and 478 lbs. He apparently plays on the offensive line which I assume is a line of similar 20 grade bodies who only profile at first base. 8:02 PM: Chris Berman seems already be intoxicated and I’m reminded that I know nothing about football anymore. I am delightfully content with this. “It’s as if we’re kicking off the season tonight!”, Berman exclaims. No. Just no. 8:04 PM: Commissioner Roger Goodell gives heartwarming introduction. While attempting to remember the victims of the West, Texas and Boston bombing tragedies, he is booed mercilessly by the drunken ballfoot fans of New York. USA chants break out. What the hell is this? 8:11 PM: Kiper mentions trading down for someone named Ryan Madson. 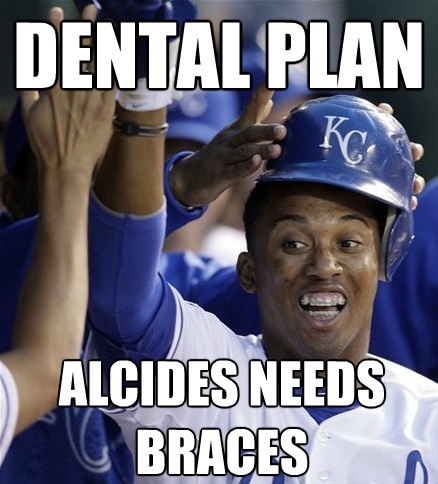 I was almost positive he was on the DL, but maybe he’s draft eligible…? Not sure this would be the best career move for him. While admittedly the role as Angels closer is an intimidating task, entering the League of National Football seems ill-conceived. 8:12 PM: Barkevious Mingo sounds like an awful, awful disease. And is unquestionably straight from Key & Peele. 8:17 PM: The aforementioned unfathomably large Fisher is taken number one overall by the Kansas City Chiefs. It’s nice to be reminded that the #BARVES and the Indians aren’t the only professional teams left offending Native Americans on a daily basis. 8:20 PM: I switch over to the Reds-Nationals game and am instantly more entertained by Bronson Arroyo’s facial hair than anything that has happened in the NFL Draft so far. Bryce Harper doubles down the left field line because duh. 8:31 PM: Berman is yelling random stuff at Kiper and Jon Gruden and they literally don’t know how to respond, resulting in an uncomfortable amount of silence. 8:33 PM: The Raiders trade their pick to the Dolphins for some reason that I don’t care about but man oh man I wish teams could trade draft picks in the MLB draft. 8:35 PM: Miami takes a guy named Dion Jordan who is on the phone in tears and an underwhelming bow-tie. Gruden looks mortified. HOW COULD THEY DO THIS TO HIM ?!?!?!?!?! When asked about the trade, Jordan explains to Suzy Kolber “it surprised me, cause it’s my first time”. As opposed to…? 8:43 PM: I’m reminded that a lot of the music played over ESPN football highlights sounds like it’s straight from Mario Kart 64. The E-A-G-L-E-S take another large human named Lane Johnson. Lane’s VIP table in the back includes a young woman with braces (who I can only assume is related to Alcides Escobar) and a short old man with a 70 grade mustache and a cowboy hat. 8:47 PM: Chris Berman compares the draft to playing with Legos. Not sure where to go from here. 8:51 PM: With the fifth pick, The Lions take a guy who is apparently from Ghana named Ezekiel Ansah. He gives who I presume is his mother an extremely slow hug. He has cornrows and is wearing hipster glasses that I’m 83% sure do not have lenses. Wait no, 100% sure. Wow. Apparently he plays football. 9:10 PM: The St. Louis Rams take speedy WR Tavon Austin. Would Tavon be better than Trayvon in center field? These are the vital questions that ESPN fails to ask. 9:17 PM: The Jets are about to draft someone and everyone is going to boo. It’s the excessive pitching change of the NFL Draft. 9:18 PM: The Jets draft someone and everyone boos. 9:27 PM: The Titans, my favorite team as a child (RIP Steve McNair) draft an immense offensive lineman from Alabama who apparently could not find a jersey that fit him during his entire career there. Yay? 9:31 PM: I can’t take it anymore. I’m off to make more Darvish .gifs.